This set features a 100% poly woven tie that measures 57" long and 3.25" wide, matching hanky, premium cufflinks and tie bar made of brass. This set is perfect for birthdays, Christmas, and Father's day. 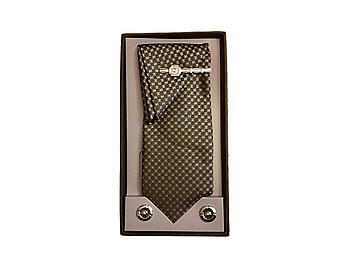 --100% Poly Woven tie with matching hanky. --Premium cufflinks and tie bar made of brass. --Boxed & ready for gift giving. --All colors shown are web representations, actual colors may vary.